Burr elm veneer with black edging & dancing couple inlay with floral scrolls. Brass feet, satin finish. 1 tune 18 or 22 note clockwork wound from underneath. A selection of tunes are available to choose from when ordering below. 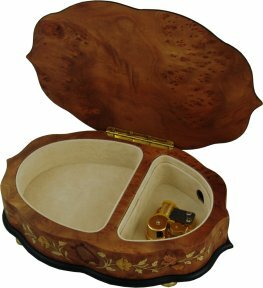 A beautiful, hand crafted curved musical jewellery box finished in burr elm with a gorgeous dancing couple inlay surrounded by floral scrolls. 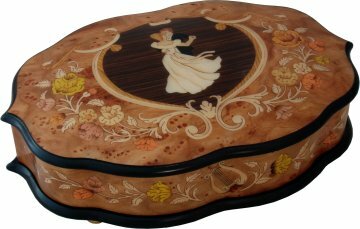 The sides of this finely shaped music box are all inlaid to make it a really special jewellery box. Lift the lid to reveal the plush lined interior and play the musical movement. Wound from underneath, the movement is on show to one side under a clear cover. A beautiful music box for your special occasion. Choose between the 18 note tune selection, or for a melodious jewellery box, select the more elaborate and longer playing luxury 22 note movement to be fitted. For more information on the musical movements used, please click here.